Judge training is offered in March. Judging Day for BASEF 2018, sponsored by ArcelorMittal Dofasco, will be on THURSDAY, March 22nd, 2018. We appreciate your support of BASEF and look forward to your participation in the upcoming Fair by volunteering as a Science Fair Judge. 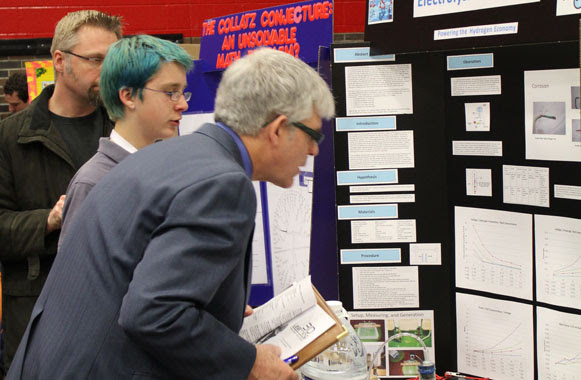 You can learn more about the science fair at our website ( www.basef.ca ). There is information of particular interest to Judges in the Judges Section, accessible via the side menu. There are also many other resources on our site – our Annual Report, our Fair Results, and our ‘Science Success’student and teacher workbooks, among others. We’d be pleased to answer any questions you may have. Training sessions for judges will also be available in March. Thanks in advance for any assistance you can provide in helping with this valuable and enjoyable community opportunity! The 58th annual fair is being held at Mohawk College, Fennell Avenue in Hamilton, Thursday, March 22nd, from 8:30am to 4:30pm. Registration for Judges is now open and available online. BASEF is entirely volunteer driven, and we thank everyone that helps make this fair possible through giving of their time as judges, organizers, and much more. In addition, the fair is run by a non-profit charitable organization funded entirely by sponsorships and donations. Many of you are involved with our existing sponsors, but if you or your company/organization is interested in helping to support the participation of youth in science, technology, and engineering, please consider a donation or sponsorship for the upcoming fair. Over many years the fair has provided great opportunities for local youth to participate in an exceptional experience. We are affiliated with both national and international science fair organizations, and send many of our winning students on to the Canada-Wide Science Fair and the Intel International Science and Engineering Fair. BASEF 2018 will again give grade 7 to 12 students the chance to showcase their hard work on science, engineering and math related projects. BASEF is open to students from the City of Hamilton, the Region of Halton, Haldimand County, Norfolk County, Brant County, and Six Nations, including students of independent and private schools as well as home-schooled students. There are also many other volunteer opportunities available for parents, friends, and BASEF alumni looking to help out throughout the fair. Interested in staying up to date with BASEF news, announcements and events? Follow us on Facebook, Twitter, and sign up for our email newsletter for all the latest information! The continued success of this event depends on the support of judges who will volunteer their time, effort and expertise to learning about what students have discovered and want to share. We need more than 150 judges in order to provide the kind of first class judging experience these students deserve!